Until a staff member is assigned or they claim a ticket they are all considered "Unassigned". Assigning tickets to staff members ensures that someone is responsible for managing the query. Checking the unassigned tickets listing regularly is important so that new customer enquiries and issues are picked up. To view unassigned tickets go to Helpdesk > Unassigned tickets , notice that the menu displays the current number of unassigned tickets in brackets. They are also displayed in the notification area on the left-hand side of the screen. 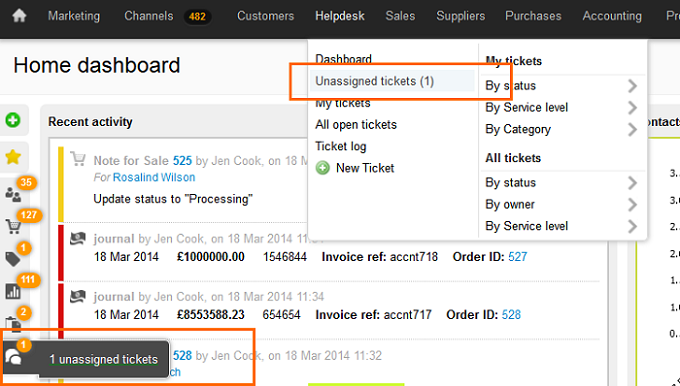 Whenever you see a ticket listed you can hover your mouse over the subject to display a bubble of information. This allows you to read the description of the ticket without having to right into it, so you can scan quickly down the list and see what they're all about. View a listing of all tickets assigned to you by going to Helpdesk > My tickets . This will automatically apply a filter to the ticket listing. Click the cross next to the report title "Tickets assigned to me" to remove the filter and view all tickets. Status - statuses are used to monitor tickets through from start to completion. Make sure you monitor those not yet completed and chase them up. Service Level - service levels can be used to give a priority level to tickets. Category - categories are used to split tickets up into groups which might be applicable to particular people or departments. They can easily pick them up by search by category. Owner - As a manager you might want to view a particular staff members list of tickets. If someone is currently available, perhaps on holiday, you can re-assign tickets in their list to other staff members. Use the quick search box in the top right hand corner of the screen to search by a particular ticket number. Make sure you select Tickets from the drop-down menu. This will include closed tickets in the search. You can view a customer's open tickets from within their contact record. Search for and open the contact, then select the Tickets tab. The tab has a number indicating how many open tickets the contact currently has. You are able to see basic information for each ticket, including the subject, description, status and who the ticket is assigned to. Click any ticket title to open it. Tickets are only considered "closed" once they have reached your complete status. You can include closed tickets on any of the listings using the filters. Tick the checkbox Include closed tickets . Use this report to view further detail on all the tickets raised in the Helpdesk. You can use this to see timestamps of when the ticket was created, how long it took someone to respond to it, how long it took to complete and the total time spent on it. You can filer the report by category, service level, rating, status or owner by clicking on the relevant item. This is also where you can see which of the staff members are getting great feedback ratings from the customers, use the filters to view tickets assigned to a staff member at complete status and of the desired rating.